Between his wife Katherine’s diagnosis of glioblastoma and her quiet death less than three years later, Mee (The Call of DIY), his siblings and his mother bought a bedraggled zoo, complete with decaying buildings, a ragtag group of animals, an eclectic staff and a reputation that had been quickly going to the wolves. In this occasionally charming (to his children: Quiet. Daddy’s trying to buy a zoo) but overly wordy book, Mee writes about caring for his dying wife and their two young children, dealing with Code Red emergencies (when a dangerous animal escapes its confines), hiring staff, learning about his new two- and four-footed charges and setting his sights on refurbishing his zoo into a sanctuary for breeding and raising endangered animals. Mee tends to meander with too-long explanations for one-sentence points, and the awe he feels about each individual animal is repetitive. Coupled with Britishisms that are never explained and a curious lack of varied wild animal stories, this book that was obviously meant to make animal lovers roar with pleasure will only make them whine with frustration. I have to confess that this isn’t a book that ever would have crossed my path if I hadn’t seen the movie with my husband and parents over the December holidays. We chose this film because I wanted something that was non-violent and uplifting, and while the movie re-set the events in America, and sanitized the more brutal aspects of Benjamin Mee’s memoir, it was true to the source material in spirit, and quite enjoyable, overall. The book, on the other hand, was naked, honest, sad (at times), happy (at other times) and ultimately left me with a better understanding of what it takes to commit to something to life-changing as to buy and renovate a wild animal park. I mean, I’m involved with dog rescue, and this makes my efforts seem so puny by comparison. Still, it was a satisfying read. I wish Mee’s wife had lived, at least long enough to see the zoo turn a profit. I wish some of it had been easier for him and his family. Memoirs are tough to read, because you sometimes find that you dislike the author. 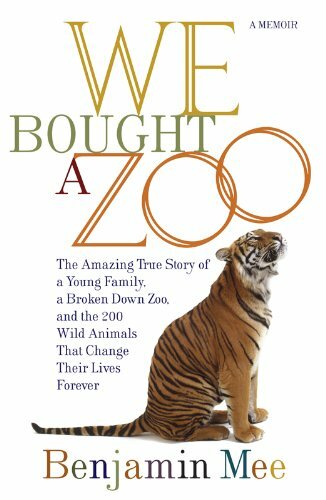 Mee’s memoir left nothing to dislike, and made me long to fly to England and visit his zoo.